Upgrading Multia firmware over BOOTP/TFTP: instructions, and a new download url for the image. You need to do this in order to be able to do the actual install. Messages from the multia-users mailing list at UNSW. Telford Tendy’s Multia reference material. Some useful information Telford has found out about the Multia. How I Installed My Diskless Multia, by Angus Lees. turn on muttlia. if it stops at a >>> prompt, then you are in the SRM console. otherwise, you are at a blue menu, called ARC. we’ll use ARC later to boot from, but right now, you want to be in the SRM. 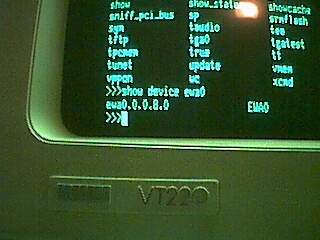 choose “Supp Menu”, “Set up the system”, then “Switch to OpenVMS or Digital UNIX console”.. CHoose “switch to digital UNIX” or “openVMS”, it doesn’t matter, as long as it’s not the NT option. go back then power cycle the machine. the machine should boot into SRM after a video test. make sure you have a net connection. don’t make the disk bootable, or a boot disk, just skip that and reboot.. this is important for making your multia bootable later. 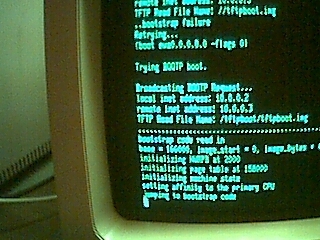 >>>boot ewa0 -proto bootp -flags "root=/dev/hda3"
go to "Change a boot selection"
go to the boot menu, choose debian. watch as your lovely new debian system comes online.